In a Dutch oven cook pasta according to package directions, adding broccoli for the last 5 minutes of cooking. Drain well. Return to hot Dutch oven. Meanwhile, in a medium bowl combine chicken pieces and adobo seasoning; toss to coat. In a large skillet heat oil over medium-high heat. Add garlic; cook and stir for 30 seconds. Add chicken; cook for 3 to 4 minutes or until chicken is no longer pink, stirring occasionally. Add chicken to drained pasta and broccoli in Dutch oven. Stir in mayonnaise and pepper. Cook over low heat until heated through, stirring occasionally. Use frozen broccoli instead of fresh. 70% less sat fat • 33% less fat than the original recipe. In a rush? 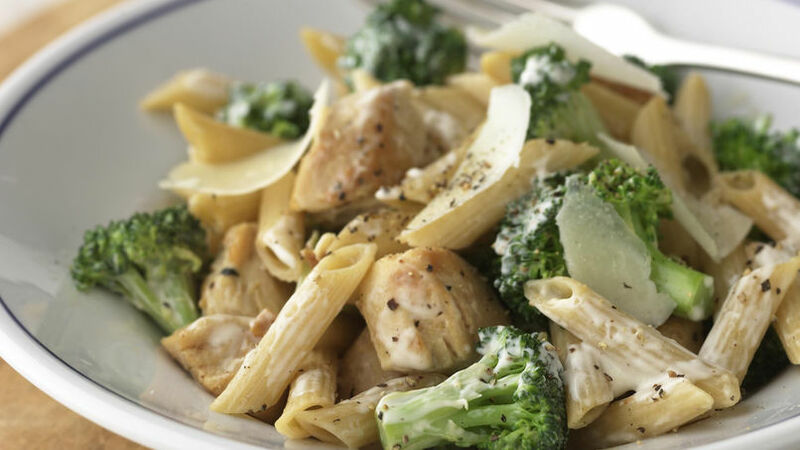 Now you can enjoy chicken teamed up with broccoli and pasta in less time than it would take to get food delivered.